Good hiking footwear is one of the essential things that you will need to have on yourself for the best hiking experience. Being an activity that relies for the most part on the well being of your feet, it will be a mistake to overlook the necessity of finding the best hiking boots or shoes and wearing the regular old shoes that you wear around the city. For no matter how good a structure they may possess, outdoor adventures may have you faced with the elements in a way that you have never been faced with before. And to get by, you need to do some groundwork, the most important of which is to invest in a pair of the best hiking boots. And on that front, our choice, and the choices of many seasoned hikers seem to collide- that being the Salomon Quest 4D 2GTX hiking boots. No matter how performance oriented a pair of boots may be, no one want to look clumsy. But the Salomon Quest 4D 2GTX hiking boots have you covered on that front. Not only do they look great, but they give us that sense of assurance that everything will be A-Okay on the way. One of the essential things about a pair of boots is the ankle support, and these boots have you covered in that aspect. Get a feel for the mid-top rise of these boots and you will not question the kind of ankle support it is designed to provide. Next come the laces, which are a pretty heavy duty and stay slip free for the most part. So with the combination of these two points, you can rest assured knowing that your feet will have proper support holding them down. Finally, when you get to the bottom of the feet, you can see that the lug design is nothing short of extraordinary. While you may not be acquainted with the specs just yet, you will not be mistaken to conclude that these have been built for great traction, even in wet weather areas. If you are looking for the best pair of hiking boots, then you need to take a look at the features list before trying them on. This will help make it easier for you to determine if they meet the requirements of your next trip. To start with the material, the Salomon Quest 4D 2GTX boots are made of a combination of leather and textile. While these materials are restricted to the upper, the sole is made of a durable synthetic material. It is built for an aggressive hiker, which is something that can be foretold by looking at the protective toecap in front. The lacing system is also unique and built to take on hostile territories without coming loose. The midsole and shaft-to-arch measurements vary for the men’s and women’s models, but the GORE-TEX Performance Comfort membrane is a constant, therefore providing unbeatable waterproof protection. Now we arrive at the most crucial part. 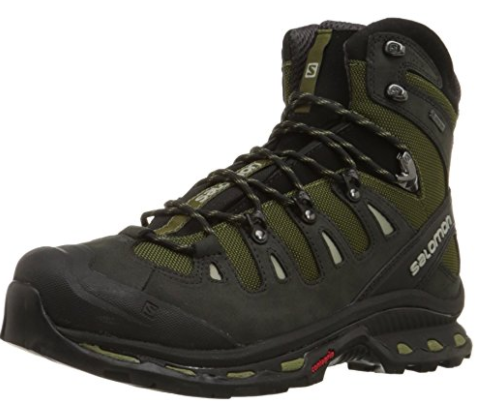 To tell the truth, the Salomon Quest 4D 2GTX hiking boots are some of the best you will ever come across for aggressive hikes, even when you have a ton of load to bear on your shoulders. These boots are incomparable in terms of stability as well as comfort, which is thought to be a rather elusive combination. Everything from the midsole support, to the arch support, simply feels incredible, and you can wear these boots just about anywhere. Try wearing them out in wet weather conditions, including on slippery rocks, and you will be surprised at the kind of traction they provide. Thanks to the lacing system, your feet will remain locked in place to give them the most support. However, we have to state that they aren’t great for prolonged use, not only for durability issues but also because the underside of your feet will experience strain, especially if you are carrying a ton of gear on your person. On the plus side, they are some of the lightest boots you will find in their category. Despite a few drawbacks, the Salomon Quest 4D 2GTX hiking boots are truly amazing in terms of the one thing that matters- performance. Lace them in place and you will never need to look back at the boots you have worn for so long. The best part is that you can buy them both in men’s and women’s versions. While they are expensive, they are also worth every penny.